According to the CDC's official figures, more then ten thousand Americans died from swine flu infections. How many of those people could have been saved if they had taken vitamin D supplements instead of a seasonal flu shot? That is the question that now hangs over the heads of all the vaccine pushers at the FDA, WHO and CDC who have yet to admit in a single public story that vitamin D could have saved lives (or that the vaccine might be harmful to anyone). A recent study found those who were vaccinated with the previous seasonal flu were 103% - 274% more likely to be infected with H1N1 than those who skipped the vaccine! That's some powerful information that is not being reported by the media about your health and should be! A vaccine actually weakens your immune system from future infections. This is a well known fact by the CDC and many in the medical community. So the more vaccines you get, the more likely you are to catch the flu. The more you catch the flu, the more you think you need a flu shot. That's what the pharma companies count on. Big Pharma scores revenue from you and sends you back out into the world with a weakened immune system yet again, perfectly positioned for endlessly repeating this cycle and making them big profits at the same time. Big Pharma's high-profit medications follow the same strategy: Osteoporosis drugs, for example, actually cause bone fractures. Psychiatric drugs cause psychiatric disorders. Chemotherapy drugs can cause cancer, and so on. Yes it sounds crazy but this is proven time and time again yet never reported in the media. You'll never hear this deadly information because they don't want you to. It's all about the money! 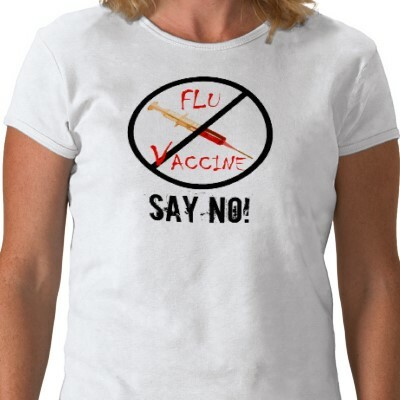 All you need to do is start saying NO to vaccines and say YES to Vitamin D and sunlight! It's really that simple, and the same goes for your children, too. When you have vitamin D and good nutrition, you don't need vaccines and you're extremely unlikely to catch any seasonal flu. Make sure your buying the most natural form of Vitamin D3 , and take about 10,000 IUs per day. This amount has been proven completely safe and effective and won't harm you in any way or affect any medications your currently taking. You can learn more about the flu and many other natural health topics at: Natural News.